Gluten-Free Saver is a group buying site that’s customized to fit your gluten-free needs. They partner with trusted businesses to offer you exclusive, limited-time promotions on your favorite gluten-free products at 37-80% off retail price! 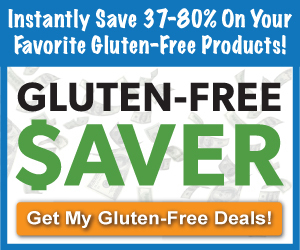 Sign Up for Gluten Free Daily Deals from Gluten Free Saver! Are these deals good for Canada? I have asked…will let you know the reply April! Unfortunately, the retailers can’t foot both the deep discount and the shipping costs to Canada. So sorry!